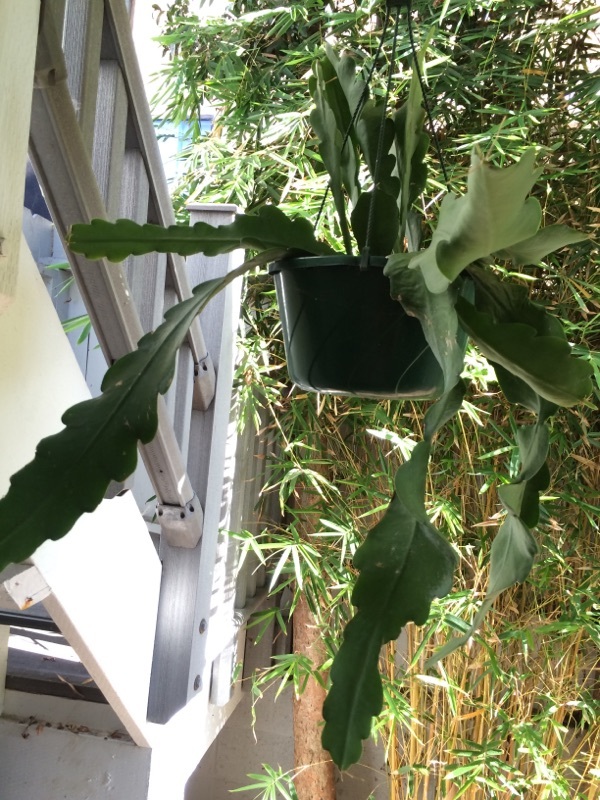 This plant is an orchid cactus. 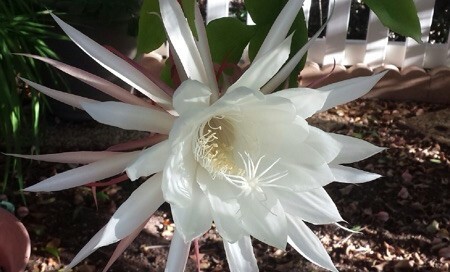 Usually called Epiphyllum but most garden varieties are actually hybrids between Epiphyllum and other cactus genera, hence it may be listed as "Epicactus". It is from the tropics and bears gorgeous flowers in the spring or summer depending on the variety (may take 3-5 years to bloom from a cutting). In your area, it can be kept outdoors in spring and summer in filtered light and should be watered regularly. Feed with a slow release fertilizer formulated for blooming plants. Tends to sprawl but that older growth is usually where the flower buds develop. Bring indoors whenever frost is predicted and place in bright indirect light. Best displayed in a large pot or hanging basket to show off the blooms. This is a prostrate succulent herb covered in large bladder cells, giving it a distinctive glistening appearance. Introduced from Europe and Africa, its unique physiology and ability to accumulate salt has enabled it to establish in disturbed and saline areas in ranges far from its native habitat. It is found on a wide range of soil types, from well-drained sandy soils (including sand dunes), to loams and clays. It prefers acid, neutral or alkaline soils, but can tolerate nutritionally poor or saline soils. It is a salt accumulator. After plant death, the salt leaches from the decaying plant into the surrounding soil. 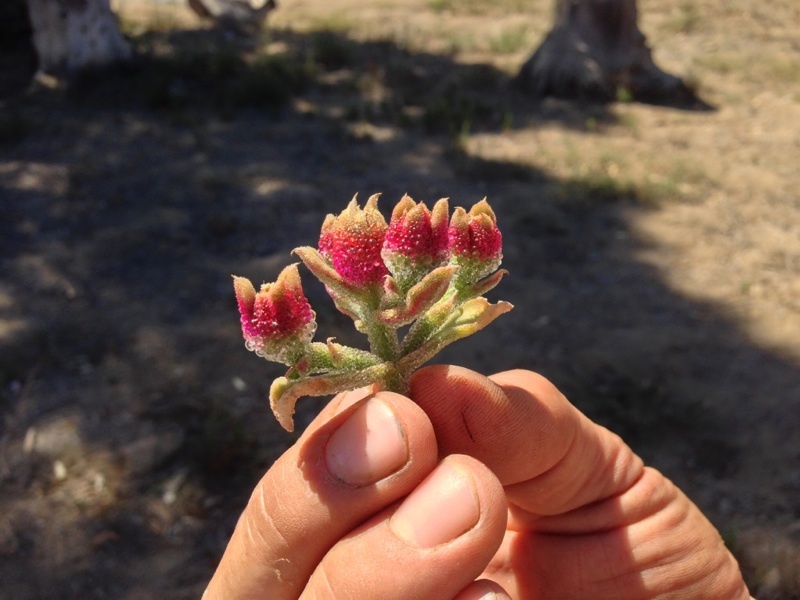 This increased salinity stops other, less salt-tolerant species from establishing. Needs occasional water, full sun, and protect from frost. 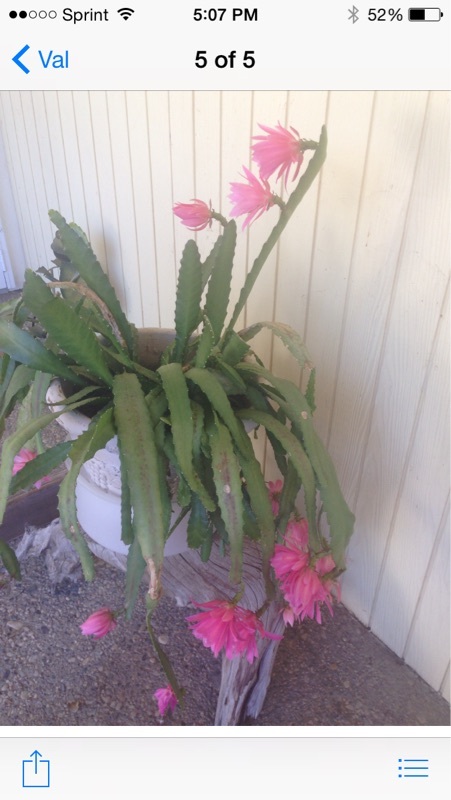 This lovely blooming plant is an orchid cactus. 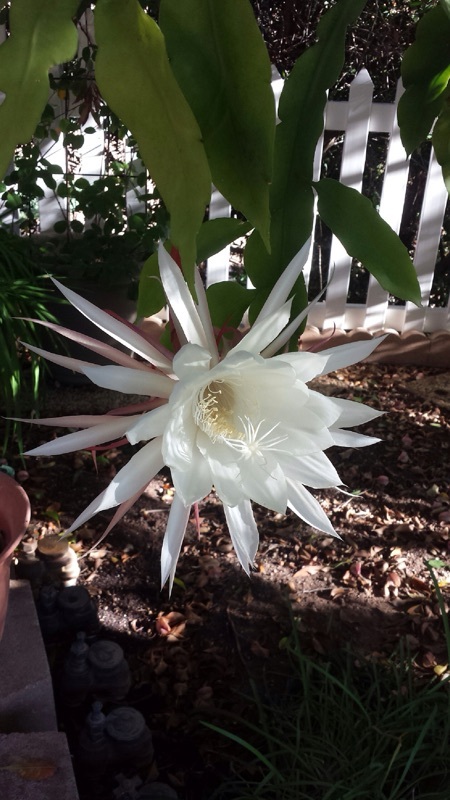 Usually called Epiphyllum but most garden varieties are actually hybrids between Epiphyllum and other cactus genera, hence it may be listed as "Epicactus". It is from the tropics and bears gorgeous flowers in the spring or summer depending on the variety (may take 3-5 years to bloom from a cutting) in filtered light and should be watered regularly. Feed with a slow release fertilizer formulated for blooming plants. Tends to sprawl but that older growth is usually where the flower buds develop. Bring indoors whenever frost is predicted and place in bright indirect light. Best displayed in a large pot or hanging basket to show off the blooms. Individual flowers only last a few days at the most. 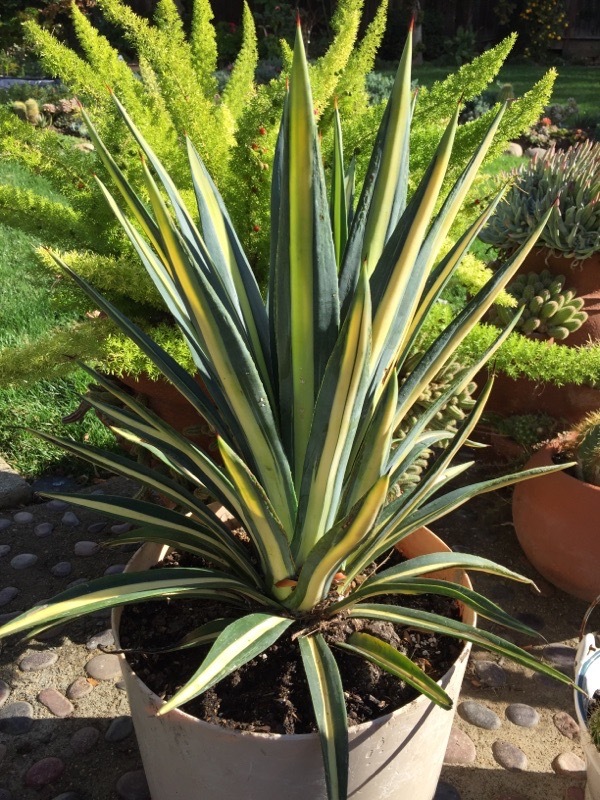 Furcraea is a genus of succulent plants related to the Agave family, native to tropical regions of Mexico, the Caribbean, Central America and northern South America. These plants are often confused with Agave because of there similar dramatic look and drought tolerance. They are also usually less toothy and spiny, and the leaves are a bit more soft and floppy rather than as rigid as an Agave. 'Mediopicta' has a decorative creamy band that occurs down the middle of the leaf. The flower stalk reaches to 25' tall and produces strongly-scented greenish-white flowers attractive to bees. 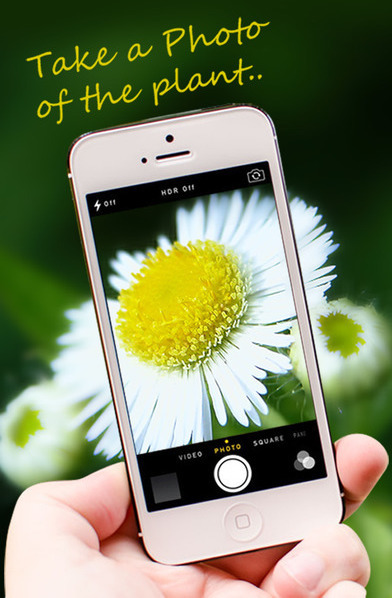 Flowers are followed by small plants that cover the spike as the main plant dies. It performs best when in filtered light and watered infrequently. 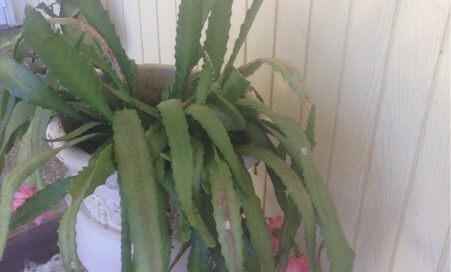 Hardy to around 25-30 degrees F.
This plant is an orchid cactus. It is from the tropics and bears gorgeous flowers in the spring or summer depending on the variety (may take 3-5 years to bloom from a cutting). In your area, it can be kept outdoors year round in filtered light and should be watered regularly as long as weather remains mild. Feed with a slow release fertilizer formulated for blooming plants. Tends to sprawl but that older growth is usually where the flower buds develop. Bring indoors when frost is predicted and place in bright indirect light. Best displayed in a large pot or hanging basket to show off the blooms. To flower, the plant needs more than 12 hours of darkness per night in early to mid-autumn. Avoid artificial light during this period. 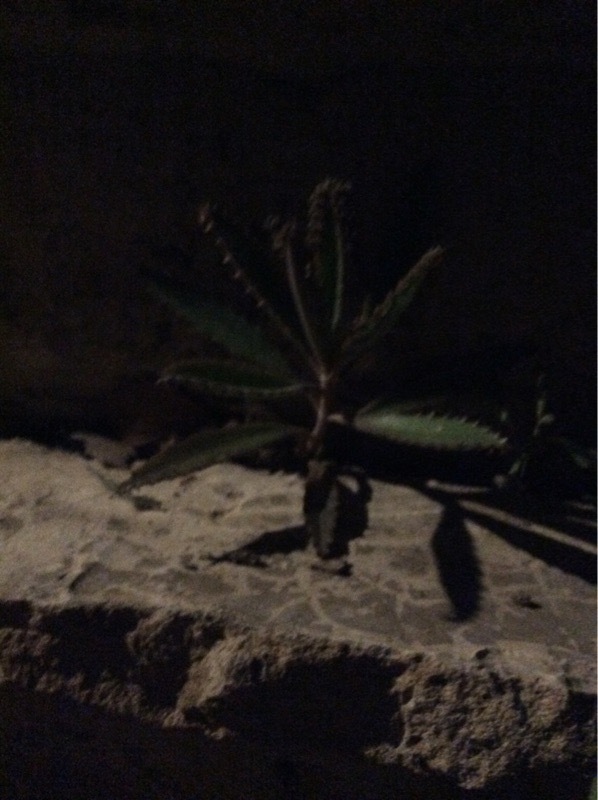 Photo is a bit dark and we cannot see the details clearly but we believe this is a great Kalanchoe. 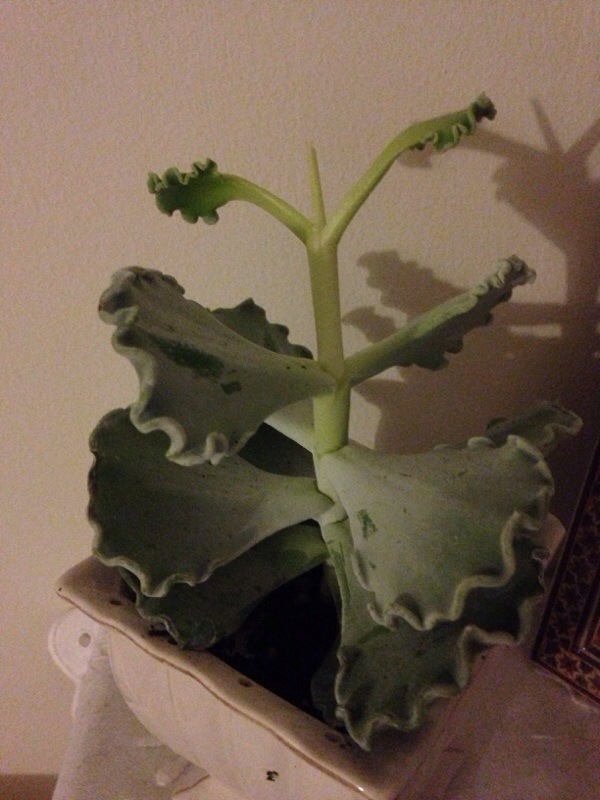 It is a succulent that thrives with sun and very well-drained soil, water only when the soil feels dry down to your first knuckle. Make sure the container has drainage holes otherwise it may develop root rot. And if not in a container, make sure the soil is very well-draining. As you described, "Baby" plantlets form along the leaf edges and drop off the leaves and every one has potential to be mother to thousands more. Great plant for sharing with friends as it is so prolific. At maturity it will have a large flower spike out of the top with large umbels of beautiful hanging bell-shaped pink to salmon colored flowers - as interesting as the plantlets are, the flowers are magnificent! 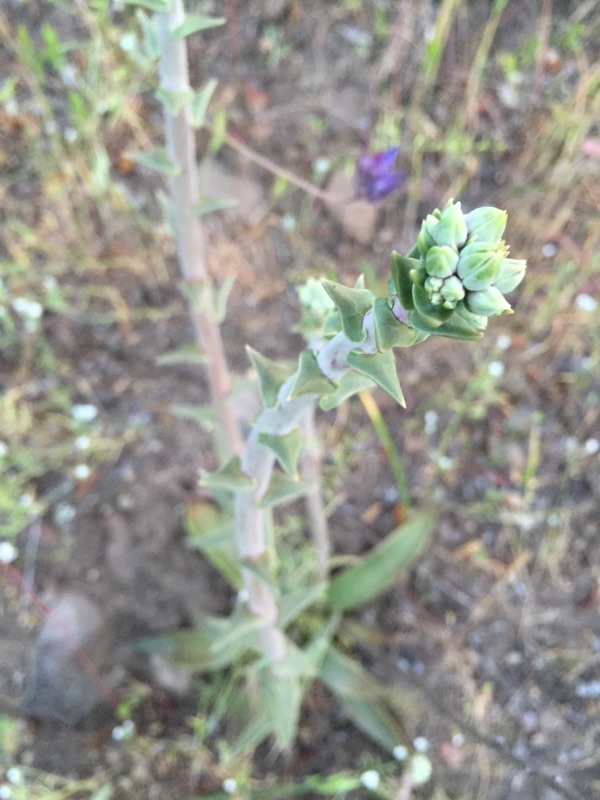 Dudleya is a large genus of about 40 species, many of which are native to California and northern Mexico. Only a handful are common in cultivation and many are on the endangered species list. A few can only be found on some of the islands off the California coast. Most Dudleyas flower in late winter to early spring, and flower colors range from white, to yellow to bright red. D. lanceolata is a native of Southern California and Baja California as well. It is a solitary species with very fleshy, tender, lance-like, dull-green leaves. These are winter growers, often being dormant in summers. Watering some Dudleyas in the summer can simply kill them, so best to seriously reduce summer watering and be sure they are in very well-draining soil and full sun. Euphorbia grandicornis, native to Kenya and Natal, forms shrubs to 6' in height. The main trunk branches frequently, producing many green 3-angled branches with wavy, horned margins and spines in pairs to 2" in length that remind one of "cow's horns". 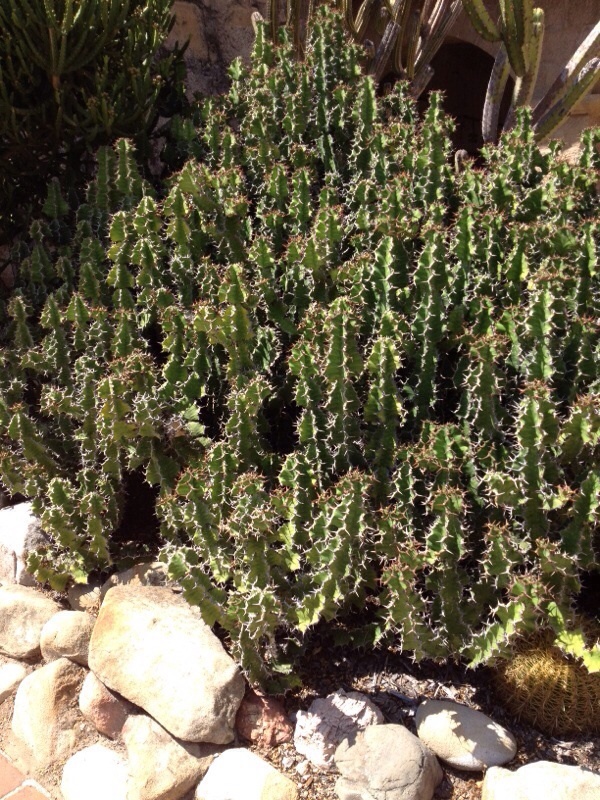 Remember, all Euphorbias contain a white sap that can be quite irritating to the skin and eyes. Avoid touching face or eyes. Wash hands immediately in soap and water if contact is made with the white sap. Responds well to warmth, with its active growth period in the late spring and summer months. Porous soil with adequate drainage. Requires bright light for best appearance, and should be given a winter resting period at which time less water should be given. Protect from frost. Cotyledon undulata superba, native to South Africa, has fleshy rounded leaves with wavy, ridged margins. Leaves are densely pruinose giving the appearance of being covered in white powdered sugar, and the edges are strongly undulated like the edge of a lasagna noodle. When blooming it has golden orange bell-shaped flowers. In habitat in Africa, Cotyledons usually grow in rocky quartz fields where they have excellent drainage provided by very porous soil, very bright light to full sun, and good air circulation. Water thoroughly when soil is dry to the touch. Water with caution in winter, as the plant can lose its roots if the soil stays cold and wet for extended periods. Summer dormant. Protect from frost to prevent scarring. This very slow growing succulent Bromeliad that has mostly solitary stemless rosettes 6"-10" wide with up to 10, but usually fewer, triangular-shaped 4"-8" long gray-green leaves that are covered in silvery white scale-like hairs. 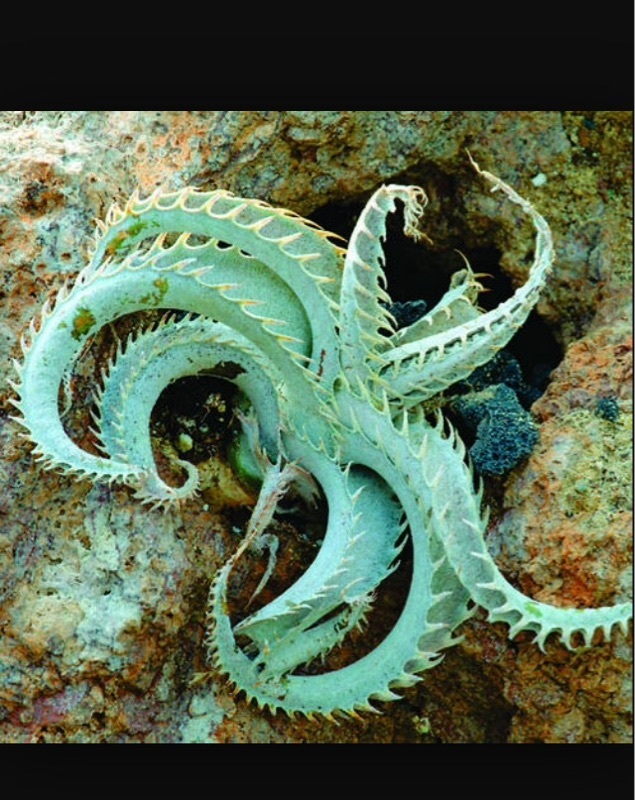 These leaves twist and curl as they recurve downward and have large claw-like recurved spines along the margins. Mature plants can send up a spike 2'-3' tall in summer with orange-yellow tubular flowers scattered near the tip. Plant in a well-drained soil in full coastal sun to light shade - leaf ends shrivel in excess heat. Give regular irrigation when plants dry from spring to summer and withhold water in winter. Protect from cold temperatures - intolerant of temperatures near freezing and much happier when temperatures are well above this.